Join one of our online communities to keep up to date on the most current new, specials, discounts and new products from Elite Design Custom Labels and Printing. 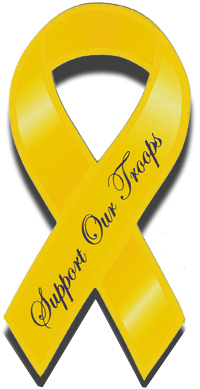 Show you support our troops by placing this high quality ribbon magnet on your car, mailbox or refrigerator. Ribbon Magnets for any event. 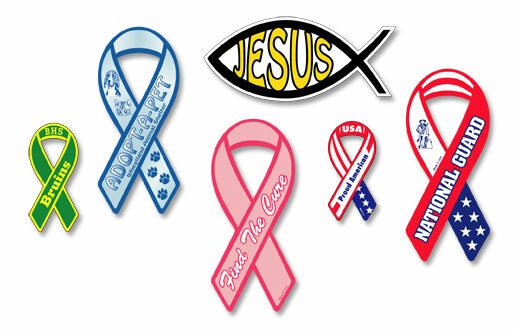 Ribbon magnets and ribbon car magnets come in many stock designs including patriotic ribbons for the army, navy, air force, coast guard and marines; breast cancer ribbon magnets and find the cure; and our most popular yellow ribbon magnets and support our troops magnets. Custom magnets are also available with your personalized message to promote any ocassion or event. Many designs available. View our selection of stock ribbon magnets. Minimums as low as 125 on custom and best prices around. Great idea for fundraisers. Quantity discounts available.  Fundraising events or charities.  Magnets are reusable, repositionable and reliable.  Made of white flexible magnetized vinyl, approximately .030" thick.  Show them you care...show them you remember with ribbon magnets from Elite Design. Manufacturers of Decals and Labels, Signs and Posters, Computer Products, Magnetic Products, Plastic Products and More! Manufacturers of custom labels and decals, signs and banners, magnetic products, business printing and more.